In 2011, the Irish Ardagh Group, a global leader in glass and metal packaging solutions, concluded a partnership with robotics specialists Socabelec and Heye International, which specialises in glass. The aim was to change and improve the health and safety of workers operating in the “swabbing” section at their factories, a difficult and hazardous part of the workplace, as well as to raise their productivity, as manual swabbing requires the machinery to be switched off. The idea was to eliminate manual swabbing, that is to say manual lubrication. However efficient workers may be, manual swabbing still has a major impact on factory productivity. We found that manual swabbing, several variables act to affect production: 1) lubrication is never exactly identical, because however meticulous operators may be in applying the lubrication, the amount of oil applied is uncontrollable and consequently differs every time, 2) the vapours released are toxic to operators and there is invariably production loss as a result of manufacturing defect due to the manual method. So much so that manual swabbing causes the loss of 5 to 6 production cycles. One year after the first version of the Socabelec robot was installed in 2013, the company had already made further improvements to make way for the 2.0. version which had been greatly enhanced, especially in terms of size, precision and reliability. The first version occupied the equivalent of three sections on the production line. 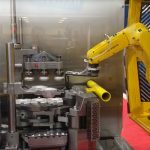 The first production line equipped with the new robot went into production in 2015, with the amount of space saved and the improved accessibility adding an undeniable step up in terms of comfort. In 2016, we are on the third version and a completely redesigned robot. The cage has been redrawn to suit the dimensions of different boxes. The robot is no longer suspended from the beam, but has been inverted so that it now sits in the cage. Today, Socabelec’s aim is to ramp up the personalisation of the Swabbing Robots in order to comply with the requests from companies and to adapt the robots to the machines already in place. This applies to the Moerdijk plant of the Ardagh Group, where Socabelec devised a rail structure (which can be seen in blue in the videos), which we adapted to suit the existing IS machines. With its experienced teams, Socabelec offers personalised development and placement of swabbing robots directly on your production lines in less than no time. On the back of two years of research and development, in 2012 the first version of the Swabbing Robot was installed on a production line. After a year of intensive operation, the second version of the robot saw the light of day. Faster, less bulky and easier to handle, version 2.0 proved a real step forward. Today, the robot has been miniaturised even further and has gained in terms of performance. It also adapts to any structures and machines in place at your factory.